A dispenser located in the first-floor bathroom of the MSU Main Library. Access to menstrual products and the stigma surrounding menstrual cycles are prevalent issues around the world, including on MSU’s campus. Student groups are aiming to improve this by changing the way menstrual cycles are talked about and by pushing for products to become more easily accessible in buildings across campus. PERIOD MSU, Spartan Women’s Health Alliance and other groups on campus have already taken steps to provide products to locations on campus and to help students navigate where they can find them in an instance of an emergency. PERIOD is a “menstrual movement” that has over 150 chapters across the nation with the goal of providing menstrual products to those in need. This fall, Nama Naseem created a chapter of PERIOD at MSU. The group has already helped provide products to those in need by creating “period packs,” which are paper bags filled with nine tampons and six pads meant to cover one person’s period. Naseem said these packs are delivered to places like homeless shelters, women’s shelters, women’s prisons and other locations in need of products. The group has also started donation drives across campus and has taken steps to inform students of locations on campus that offer free products. 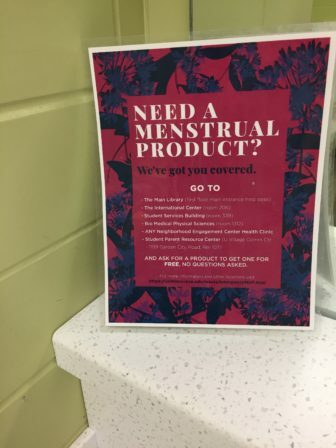 A sign listing the locations in which students can get free menstrual products, placed in the first-floor bathroom of the MSU Main Library. Naseem said there are three pillars to PERIOD—service, education and advocacy. Service is what the MSU chapter is currently more focused on, Naseem said. The service pillar involves collecting menstrual products and providing them to people who are in need of them. The education pillar urges to change the way people talk about periods and to eliminate “the taboo” and stigma surrounding them. “That’s sort of talking to the students on what a healthy period looks like and what a period even is because there are so many misconceptions surrounding it,” Naseem said. Lauren Rosewarne, senior lecturer in the School of Social and Political Sciences at the University of Melbourne, Australia and expert in feminist politics and gender and sexuality, said the inability to access and afford menstrual products are widespread concerns around the world. She said this stigma can lead to embarrassment in actively seeking out products. The advocacy pillar of PERIOD has the goal of raising awareness and creating change through events, campaigns and media relationships. Naseem said a big part of advocacy for the group is trying to repeal the tampon tax, or taxing menstrual hygiene products including tampons and pads. Only nine states—Nevada, Illinois, Pennsylvania, New York, Minnesota, Massachusetts, New Jersey, Maryland, Connecticut and Florida—have eliminated the tampon tax. Naseem said it shouldn’t be the group’s responsibility to provide menstrual products in the dispensers in bathrooms across MSU’s campus. She said the MSU administration is aware that access to products around campus is an issue. She said, if the PERIOD program is successful for one year, it will get added to MSU’s budget. That way, the group can move forward with providing products to those in need. Naseem said, moving forward, the group hopes to get the word out about the services they offer. According to Women’s Advisory Committee for Support Staff, the Associated Students of Michigan State University, or ASMSU, and the MSU Residential and Hospitality Services are collaborating in a pilot program to offer free emergency menstrual products across campus. The MSU Main Library, the International Center, the Student Services Building, the Biomedical Physical Sciences Building, the Student Parent Resource Center and every neighborhood engagement on campus all offer free products to those who ask for them, no questions asked. There are neighborhood engagement centers at McDonel Hall in room W9, at Brody Hall in room 148, at Holden Hall in room G7, at Hubbard Hall in room 127 and at Olin Health Center in room 210. People can also donate to this program at room 307 of the Student Services Building and the sales desk of the MSU Surplus Store, the Women’s Advisory Committee for Support Staff website said. “Should the pilot prove to be successful, broad-based marketing and additional locations will be added to this site,” the website said. If enough students utilize the products at the front desk, MSU will put funds toward the program. Spartan Women’s Health Alliance is a student group on campus that was also founded this fall by Kayla Fagan, who is now president of the group. The group’s goal is to get free menstrual products in all bathrooms on MSU’s campus. The group is currently donating products to the front desk locations that are offering free products to students. The group also does volunteer work involving women’s health and wellness, such as menstrual cycle drives on campus, Fagan said. She said she thinks it’s possible for the university to find a way to provide free products to students. “It’s such a simple solution and they just won’t do it,” Fagan said. Fagan said the group—as well as PERIOD MSU—proposed to put Aunt Flow products into some of the bathrooms on campus, but MSU’s Infrastructure Planning and Facilities (IPF) said the products weren’t sustainable and turned the idea down. The Aunt Flow products are “100 percent natural cotton, biodegradable tampons and pads,” according to their website. Fagan said the products are eco-friendly and the group wanted to install the free products for students to use. She said people don’t use the current dispensers because they’re old and require money. Brandon Baswell, campus services manager within IPF, said there is a specific brand and a specific style of product that must go into the dual vendor dispensers. He also said products should be in dispensers to ensure there is no waste and to keep the products clean and dry, which was a concern IPF had with the Aunt Flow products. Baswell said IPF is working with student groups to find what the best option for distributing products on campus is. There are free products in the dispensers in Wells Hall as of this fall. Baswell said use of the products has slightly increased since the products have been free in the building. If MSU finds that enough students are using the free products in Wells Hall, they will consider putting free products in more buildings across campus, Baswell said. Since there is a lot of traffic through Wells Hall, Baswell said it will be a good predictor of how many students are using the products and how much product is needed. IPF will monitor the activity of the free dispensers over the course of the 2018-19 academic year. Campus dispensers – a last resort? According to documents obtained through a Freedom of Information Act request, out of 640 women’s bathrooms in buildings across campus, 296 of them have dispensers for menstrual products in them. Baswell said the dispensers on campus are stocked weekly by custodial services. He said the bathrooms near classrooms tend to have more usage than in other parts of buildings, such as above the first floor. 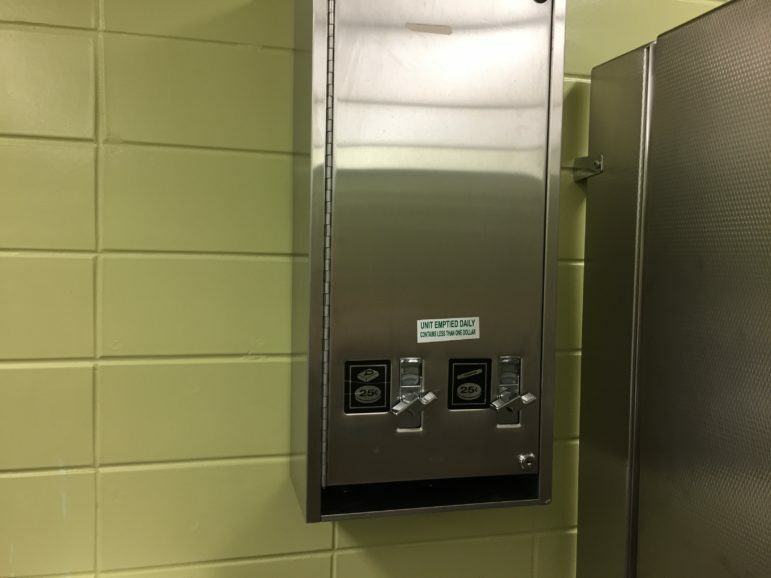 “When we installed the feminine hygiene dispensers on campus years ago, a focus was to really just have them in first floor restrooms and, since then, it’s expanded not exclusively to the first floor, but mostly,” Baswell said. Baswell said IPF will replace or fix the dispensers if they break due to old age or vandalism. He said the dispensers cost around $300. He said, overall, there isn’t a lot of use of the dispensers, whether they’re old or new. King said she asked her class about the tampon and pad dispensers located in bathrooms around MSU’s campus. She said most students who responded in her class said they can’t rely on the dispensers because they aren’t frequently filled with products or because the products look too old to use. In King’s class—Anthropology 270, women and health—students learn about different issues surrounding women’s health and gender disparities in health issues, including access to feminine hygiene products and access to health care. This class normally consists of between 120 or 220 students, most of them women. She said when she taught her class about menstrual cycles and access to products, she asked students to find a newspaper article about using menstrual products in women’s prisons. King said, internationally, access to menstrual products is difficult and can have an affect on school and other interactions. King said her class also covers how socioeconomic status affects how easy or difficult it is to get access to menstrual products and how other countries face issues related to products. Although some things have changed over time, there are still stereotypes, misconceptions and stigma surrounding women’s health issues in society today, King said. She said feminist anthropology has gone through several stages. She said feminist anthropology today is concerned with addressing inequality. There’s also the broader issue of “medicalizing” or “pharmecuticalizing” women’s health issues, King said.